As a VC, it’s critical to have alignment with management, founders, board and co-investors as regards timing and approach to an exit. A VC fund has a determined life line, thus an Exit is a fundamental requirement that can be planned, never truly controlled. I’m not a “flip” fan, as it doesn’t build true sustainable value for the real parties involved. I’m a though a fan, of “build to be bought”, where after a few years of startup pains, the Company enters a growth path and can already layout a vision of what would/could happen over the next few years in terms of potential interest from (most of the times) key partners, distributors, major customers, as they are the most likely acquirers of the Company! So, while building a sustainable and viable Company, it is possible to draw up what the potential exit avenues are, and make sure the Company doesn’t lock itself into incompatible technology platforms/directions with the potential acquirers, exclusivity agreements that could limit the interest of number of potential acquirers, product roadmap that maximize its potential value and the overall direction of the Company. It’s not about putting a “For Sale” sign in front of the house, but it is about going through the process, and understanding who and why someone would come knocking at the door, and that can be planned sometimes 6, 12, 24 months in advanced. The IPO market is there for the few, the few RockStars, and the few bad apples that wiggled their way into reverse take overs and negative mergers. iNovia capital isn’t betting on the IPO market – yet we are intrigued by Tim Draper’s new Private Stock Market project due to launch in September 09. And as for M&A, yes, again, the few RockStars can go out and have a beauty contest done by the top investment bankers, choose the one they prefer and then try to get the highest bid. But again, in most cases, the Exit needs to be planned with in mind “being bought” not being “put on sale”. As a VC, it's critical to have alignment with management, founders, board and co-investors as regards timing and approach to an exit. A VC fund has a determined life line, thus an Exit is a fundamental requirement that can be planned, never truly controlled. I'm not a “flip” fan, as it doesn't build true sustainable value for the real parties involved. I'm a though a fan, of “build to be bought”, where after a few years of startup pains, the Company enters a growth path and can already layout a vision of what would/could happen over the next few years in terms of potential interest from (most of the times) key partners, distributors, major customers, as they are the most likely acquirers of the Company! So, while building a sustainable and viable Company, it is possible to draw up what the potential exit avenues are, and make sure the Company doesn't lock itself into incompatible technology platforms/directions with the potential acquirers, exclusivity agreements that could limit the interest of number of potential acquirers, product roadmap that maximize its potential value and the overall direction of the Company. It's not about putting a “For Sale” sign in front of the house, but it is about going through the process, and understanding who and why someone would come knocking at the door, and that can be planned sometimes 6, 12, 24 months in advanced. The IPO market is there for the few, the few RockStars, and the few bad apples that wiggled their way into reverse take overs and negative mergers. iNovia capital isn't betting on the IPO market – yet we are intrigued by Tim Draper's new Private Stock Market project due to launch in September 09. And as for M&A, yes, again, the few RockStars can go out and have a beauty contest done by the top investment bankers, choose the one they prefer and then try to get the highest bid. But again, in most cases, the Exit needs to be planned with in mind “being bought” not being “put on sale”. I would echo the comments here by Chris. 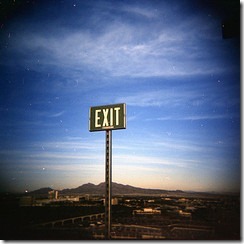 Exits need to be planned for. they happen for all sorts of reasons and they happen at differing levels of startup traction. Often they involve a fair bit of luck which has not come up in your post or Chris’ comment. Bottom line for me is that you need to systematically engineer exits the same way you build your product, team and channel. Do that, add good timing, luck and environmental factors (i.e. be in a space that is hot and have general stock markets that more stable or growing) and you have the recipe for a good exit. I would echo the comments here by Chris. Exits need to be planned for. they happen for all sorts of reasons and they happen at differing levels of startup traction. Often they involve a fair bit of luck which has not come up in your post or Chris' comment. Bottom line for me is that you need to systematically engineer exits the same way you build your product, team and channel. Do that, add good timing, luck and environmental factors (i.e. be in a space that is hot and have general stock markets that more stable or growing) and you have the recipe for a good exit. It’s funny, I was talking to an entrepreneur this week, and I asked who they thought their potential acquirers were. The stock “beauty pagenant” answer was “Google, Oracle, etc.”. And I was surprised, none of the stars were aligning for me. Not in a location where they are likely to have random encounters with these companies M&A or product management teams. Not enough customers to be in a growth phase. Not on a technology stack that matched either companies roadmap or platform. So it started me thinking, who are the second and third tier brands that might make a great acquistion? What business development has the startup done to build a relationship and demonstrate trust? Are there shared customers? Being built for an acquistion requires as you an @startupcfo suggest a sustainable company, team, product/technology and some luck. It starts with a deep analysis and understanding of your industry, competitors, etc. It's funny, I was talking to an entrepreneur this week, and I asked who they thought their potential acquirers were. The stock “beauty pagenant” answer was “Google, Oracle, etc.”. And I was surprised, none of the stars were aligning for me. Not in a location where they are likely to have random encounters with these companies M&A or product management teams. Not enough customers to be in a growth phase. Not on a technology stack that matched either companies roadmap or platform.